Application Deadline: 1st November 2018. 1. Africa, 2. Asia, 3. Canada and Europe, 4. Caribbean and 5. Pacific. (See Section 4 for countries in each region). Entrants must be citizens of a Commonwealth country– please see Section 4 for the list of Commonwealth countries. The Commonwealth Foundation will request verification of citizenship before winners are selected. Entries from writers from non-Commonwealth countries (including the Republic of Ireland and Zimbabwe) are not eligible. All entries will be accepted at the discretion of the Commonwealth Foundation which will exercise its judgement, in consultation with the prize chair, in ruling on questions of eligibility. The ruling of the chair on questions of eligibility is final, and no further correspondence will be entered into. Entries from current members of staff at the Commonwealth Foundation are not eligible. There will be five winners, one from each region. One regional winner will be selected as the overall winner. 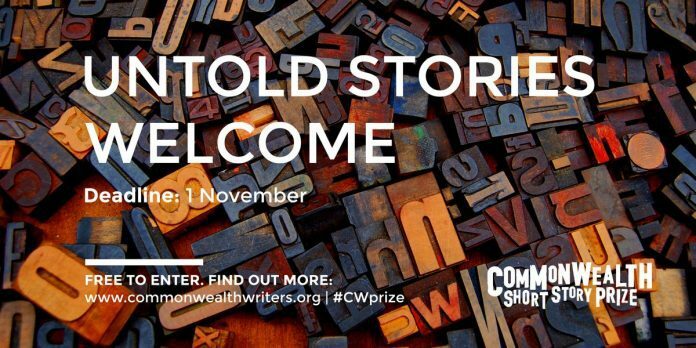 The overall winner of the Commonwealth Short Story Prize will receive £5,000 and the remaining four regional winners £2,500. If the winning short story is a translation into English, the translator will receive additional prize money. Entries,including those in translation, must be made by the original author. The deadline for receipt of entries is 1 November 2018 (11.59pm in any time zone). The story must be original work and should not have been published anywhere, in full or in part, in any language, before 1 May 2019. Published work is taken to mean published in any printed, publicly accessible form, e.g. anthology, magazine, newspaper. It is also taken to mean published online, with the exception of personal blogs and personal websites. Entries should be submitted in English, with the following exceptions: entries from Commonwealth citizens who write in Bengali, Chinese, Kiswahili, Malay, Portuguese,Samoan and Tamil and who do not have an English translation of their story, may submit their stories in the original language. English translations of short stories written in other languages are eligible if submitted by the writer (not the translator) and provided the translator is also a citizen of a Commonwealth country. Simultaneous submissions are eligible as long as the entrant informs the Prize immediately should the story be accepted for publication elsewhere or be selected for a prize. will have the unrestricted right to publish the winning stories (the overall winning story and the four regional winning stories) in an anthology and for promotional purposes. programme of regional outreach activities to develop and promote Commonwealth Writers.